Establishing a training program, including a detailed layout of the training methods the authors have used successfully over the years. 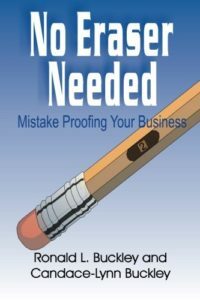 Understanding process errors, the cost of errors, the levels of Mistake Proofing, and the tools and methods used to Mistake Proof your business. The use of problem-solving tools in eliminating errors from your organization. Driving the process with “Cross-Functional Self-Directed” Teams, to successfully execute your Mistake Proofing program. In these Teams, employees from many different areas of the business work together to eliminate mistakes and errors from the business while at the same time improving their own self-confidence and job satisfaction.